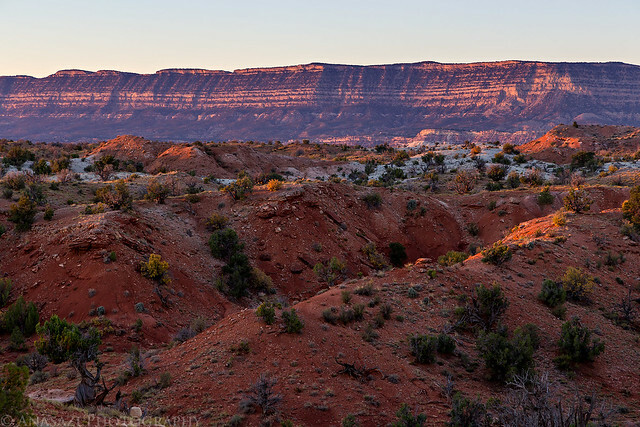 After another good night of sleep under the stars we awoke to clear skies with the morning sunlight striking the Straight Cliffs in the distance. 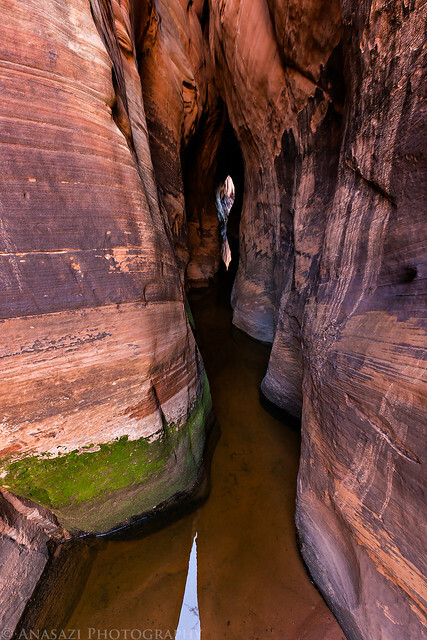 Today we planned to hike to a couple of popular and short slot canyons known as Zebra and Tunnel. 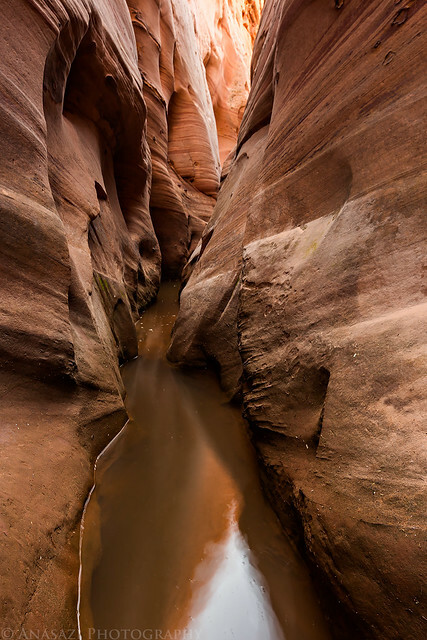 Jared and I had actually planned on hiking to these two slot canyons back in 2010 when we were in the area for our first October trip to southern Utah together, however we were chased away by heavy rain and flash flooding that week, so we never did get to visit them. After a quick breakfast we packed up camp and drove back to the Hole-in-the-Rock Road and parked at the trailhead for Halfway Hollow. 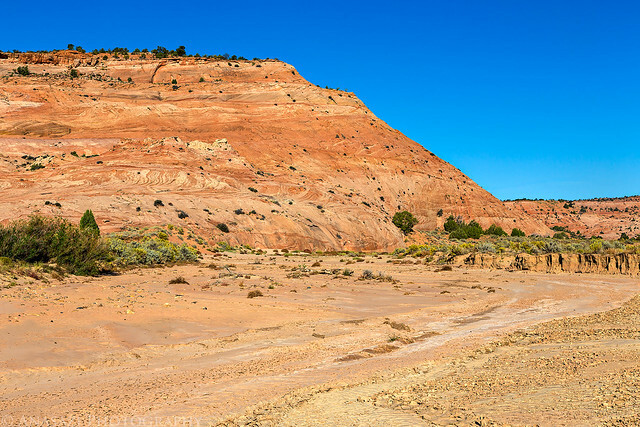 We hiked down Halfway Hollow a few miles until we reached it’s confluence with Harris Wash and then hiked up Harris Wash a short distance to the entrance for Zebra. 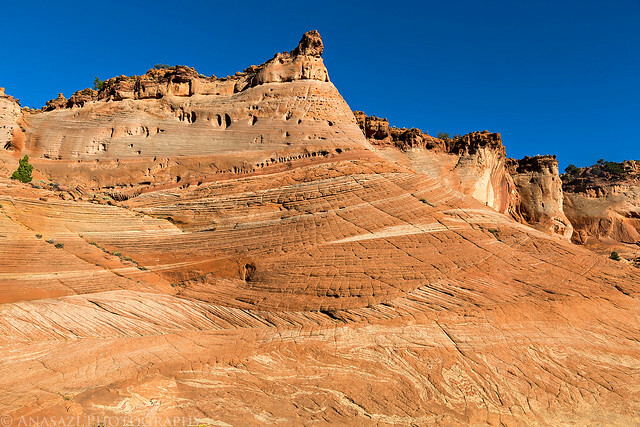 Morning light on the Straight Cliffs from our campsite above Harris Wash.
Sandstone domes along Halfway Hollow as we neared Harris Wash. 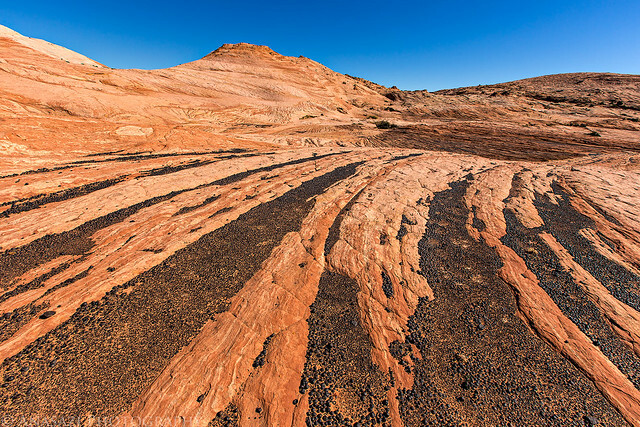 Hiking in the wide and sandy Harris Wash. When we reached the entrance to Zebra we found that it was full of water. I had read that the entrance can sometimes be full of deep water, so I had brought my sandals along, just in case. I’m glad that I did. 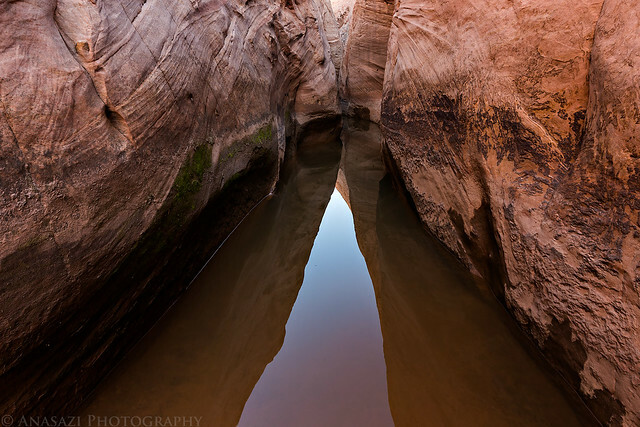 I put on my sandals and started wading through using my tripod to gauge the depth as I went. It got deep pretty quickly. I had to hold my camera up out of the water with one hand and check the depth with the tripod in my other hand. It was a little awkward. At it’s deepest point, I’d guess the water was somewhere between 4 and 5 feet deep. 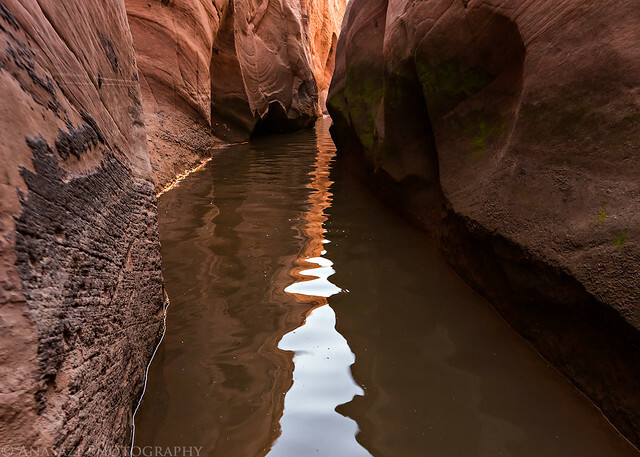 The walls of the canyon kept getting closer together as I waded through the water making movement even more difficult. Needless to say, it got a little tight in there. Eventually I was able to climb up out of the water and into the most interesting part of the Zebra slot so I could take photos. 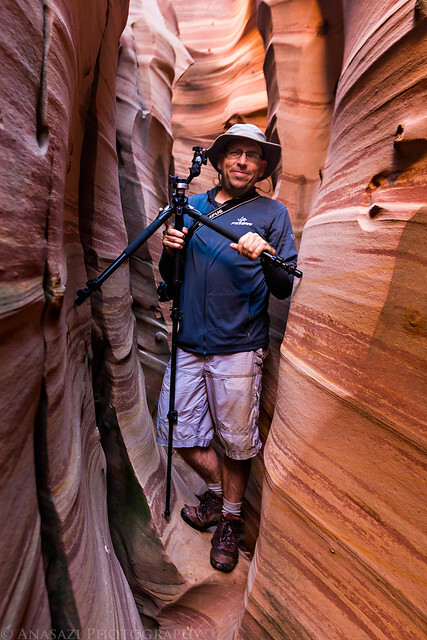 I’m not one who normally climbs and chimneys through these tight slot canyons, so it was a little difficult for me and I scraped up my arms and legs pretty good on the rough sandstone canyon walls. Photographing in here was also pretty difficult since I needed to setup a tripod for longer exposures in the low light, and setting up a tripod in the tight confines was frustrating, to say the least. 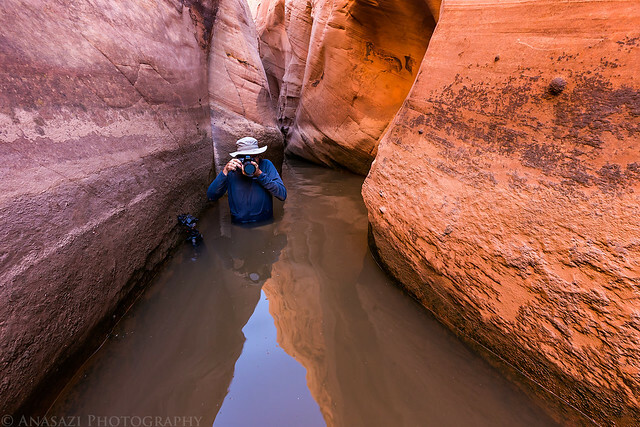 When I had entered the canyon and started wading through the water, Jared decided that he was going to stay back and wait for me, but after I had been photographing the slot for a little while I heard him coming through the water. He had changed his mind and was going to check it out after all. While I didn’t find the water too cold and had no problems standing in it for extended lengths of time without moving, Jared found it pretty cold. Calm water in Zebra before walking into it. 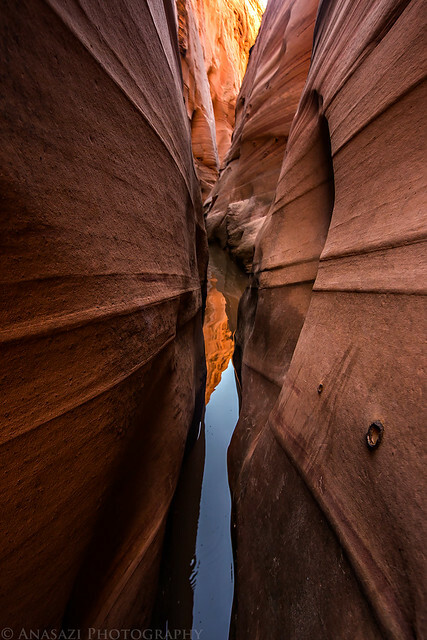 Rippled water and closing canyon walls. 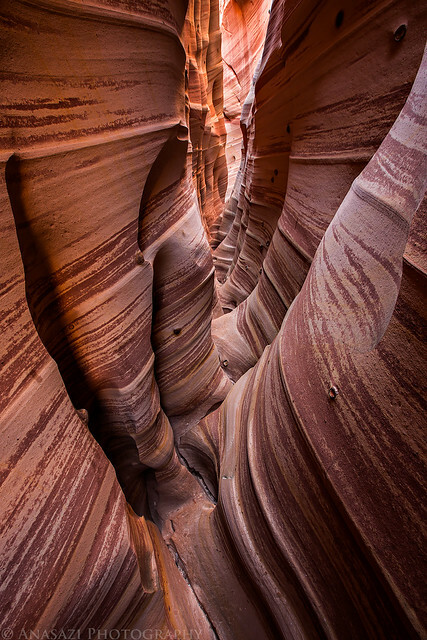 The well-known portion of Zebra Canyon. Jared sets up his tripod for a shot. I really liked the warm reflected light on the right wall in this photo. Climbing back out the narrow slot. Taking a photo of Jared taking a photo of me in the water. Thanks to this short hike into Zebra, my tripod didn’t work right for the rest if the week since it got full of sand and water. I had to thoroughly clean it when I got back home. 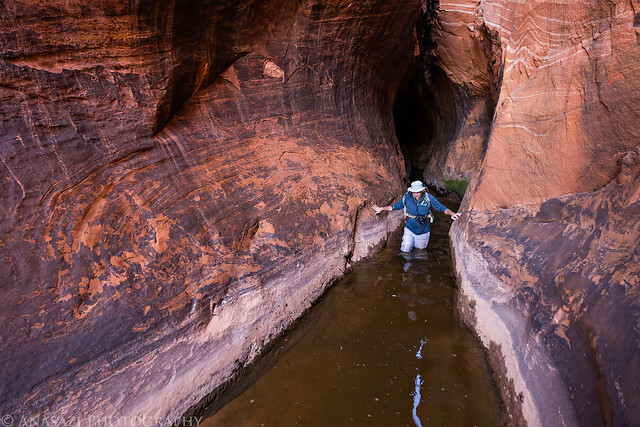 After getting back out of the slot we dried off and warmed back up in the sunlight before hiking across a sea of sandstone and moqui marbles to reach the back entrance of the Tunnel slot. It turned out to be a nice colorful area to explore. 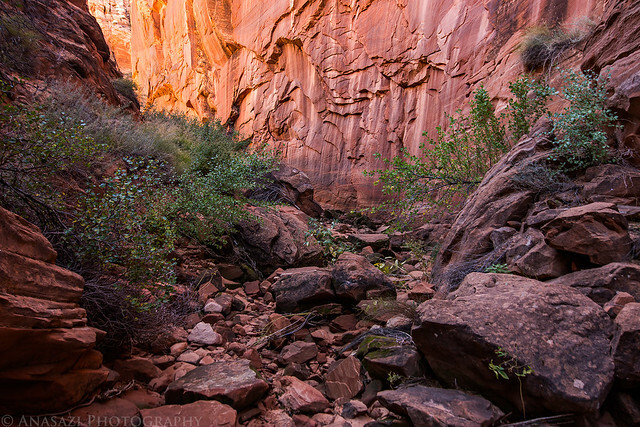 We managed to find the right drainage and dropped down into the canyon that would lead us to our destination. I had left my sandals on for the hike since I wasn’t sure if Tunnel would be full of water or not. It was a good decision as there was about 3-4 feet of water in the middle of Tunnel. Moqui marbles were everywhere up here. 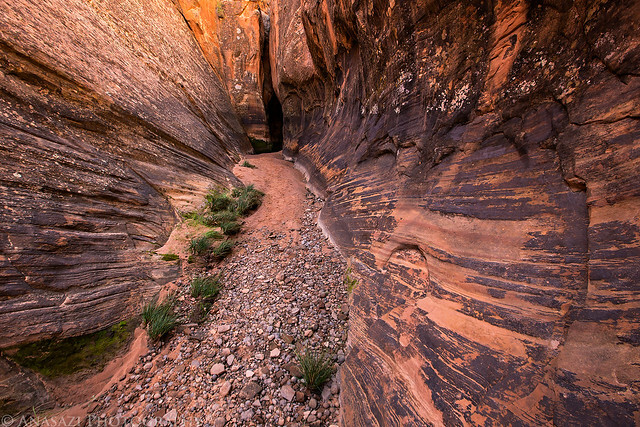 Following the canyon to Tunnel. The final passage to Tunnel. It’s that crack at the end which is also where the water started. Looking through to the other side. It was pretty dark in there. There was a little nice reflected light above the entrance. 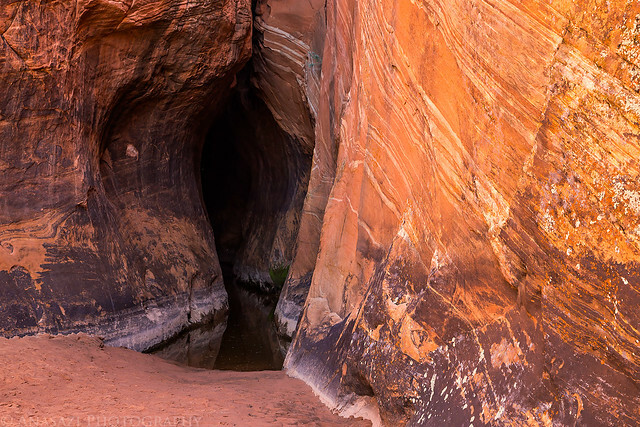 The entrance that you would first see if hiking to it from Harris Wash.
We returned to Harris Wash and completed the loop before hiking back up Halfway Hollow to my Jeep that the trailhead. I am amazed at how many places you can visit in a short amount of time. 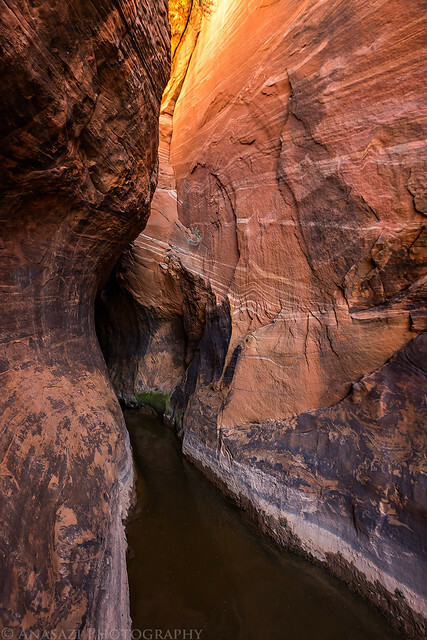 Beautiful shots of the Gulch, Zebra, and Tunnel, also Lower Calf Falls. The Canyons were full of water when we visited a couple of weeks before you, and I couldn’t get up in Zebra, can’t chimney like I used to, I had back surgery a year ago. My Son and grandson slipped into the canyons. And got some shots. 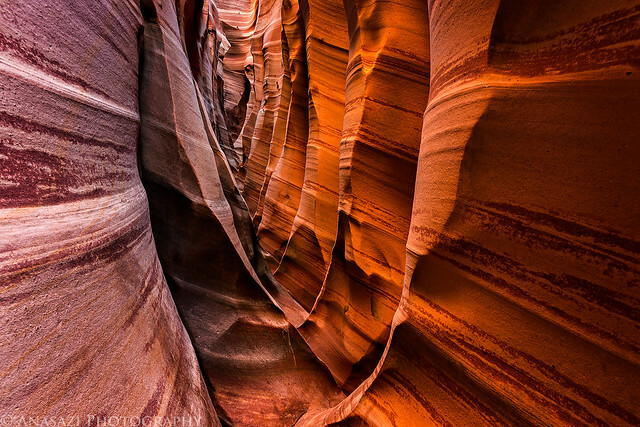 Always waiting to see your photos of these places, they are always the best. Great trip reports and photography! You’re having too much fun!